Cinque Terre: a Corner of Paradise Between Mountains and Sea. These are the Cinque Terre – the “Five Lands” of mythical imagination: a quintessentially ‘human’ landscape – and yet so harmonious that it looks absolutely ‘natural’. It is a landscape that has been looked after by men for many centuries – at first by monks in the Middle Ages – all the way to the present. Each of the Cinque Terre (which are in fact five towns or villages) lies at the end of a steep wooded valley that dissects the cliff-edged coastline, surrounded by slopes tightly terraced for vines and backed by beautifully picturesque and occasionally wild pockets of countryside. The area is also outstanding for it rugged geology: although this aspect is often not considered by the average visitor, it is something which should not be overlooked by the visitor interested in natural history and landscape features. Once the villages were only accessible by sea or on foot, and known mainly for a wine – the “Vernaccia delle Cinque Terre” – praised in verse already by Dante, Petrarch and Boccaccio. Early man carved terraces on the steep mountain slopes, exploiting the mild local climate to grow vines, figs, olives, capers and citrus fruits. These terraces are still cultivated, and are considered among the oldest in the whole Mediterranean. Even though they suffered periods of neglect, the terraces and the vineyards have now been carefully restored thanks to the presence of a very active National Park, and therefore gone back to their former glory, creating almost a work of art. Here the famous “Sciacchetrà” (a sweet wine, somewhat similar to Moscato) is also being produced. The mountainous hinterland and difficult terrain has been only partly invaded by constructions and tourism. 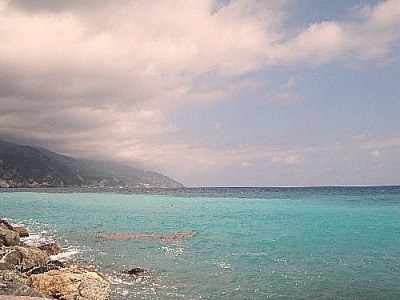 In fact, together with the mountain of Portofino, the Cinque Terre still remain the wildest part of the Ligurian littoral east of Genoa – miraculously unblemished by coastal roads, and especially unspoiled around Punta Mesco and towards the Portovenere promontory (that is, the two extremities of the Cinque Terre). Here the mountains fall to the sea in the great rocks of the Muzzerone – a favourite spot among the local community of rock-climbers. The sea-cliff climbing area at the Muzzerone is made up of 18 separate limestone crags, forming an area that has always been popular due to its dramatic landscape, the presence of the sea and easy access to some fantastic sea-cliff rock-climbing. 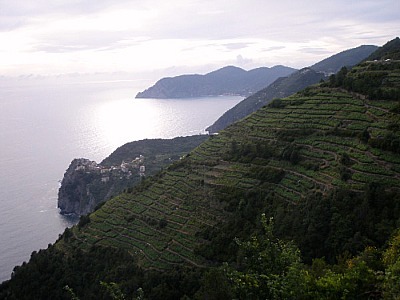 All in all, the Cinque Terre are an idealized working landscape that seems to encompass the best of both natural and cultural worlds (below, vineyards from Volastra). As anticipated earlier, the Cinque Terre take their name from the five villages that still nowadays can be encountered in sequence, four of them along the coastline – Riomaggiore, Manarola, Monterosso and Vernazza – and a fifth perched high on a hilltop (Corniglia). These five villages are connected by a coastal path that can be started as far away as La Spezia, Portovenere or Levanto, but that is most commonly accessed from Riomaggiore or Monterosso – or from any of the other three villages, for that matter. In fact, it is easy to move from one village to the next, as they are also very efficiently connected by a railway line, which works almost like a subway, running mostly in tunnels between the five villages. The best way to explore the Cinque Terre, though, is by far to walk the coastal path that links the villages: the “Sentiero Azzurro”, an excursion that will take a robust pair of legs eight hours. Though busy in summer – and only intermittently wild – it is still nevertheless one of Italy’s most rewarding walks; my best advice, in fact, is to actually stretch it over the course of two days, thus allowing time for bathing and acknowledging oneself with the gastronomic aspect of this land while crossing the villages en route – as well as taking in the floral plenty along the way. For the purposes of this description, I will follow the coastal path going from east to west, starting in Riomaggiore – which is also the first stop on the railway line from La Spezia – and finishing in Monterosso. The construction of the railway in the 1920s is responsible for one of the most astounding stretches of the coastal path – which is also its first section if you embark on it from Riomaggiore: the so called “Via dell’Amore” (‘Love Lane’). This wide, flat section of path (perhaps deceitful of what’s to come!) was first traced as a service road in order to access the railway works, but soon after these works were completed, it was transformed into a promenade, lined with blue iron-wrought railings, now unfortunately replaced (below, a view of the dramatic rock formations that run all along the “Via dell’Amore”). The “Via dell’Amore” is undoubdtedly the best-known section of the “Sentiero Azzurro”, and it certainly is also the most overcrowded; today – as anticipated above – it is unfortunately fitted with modern handrails and concrete balconies, which – despite taking some of its charm away – cannot lessen the breathtaking, rugged beauty of the surrounding scenery. More solitary are the sections from Corniglia to Vernazza, and from Vernazza to Monterosso, where the terracing becomes especially impressive and the path often turns into a series of steep steps cut into the living rock. In these quieter sections, all is harmony and natural balance: a sun-drenched alternation of headlands, rugged cliffs, lush vegetation, tree-shaded coves, cultivated slopes and consistently fascinating sea views. Extraordinarily, the tourist-filled villages have managed to retain their charm, tiered as they are on cliff-sides, and riddled with mazes of tiny alleyways – even though one may have to get away from the high streets and the more frequented spots in order to soak up the fishermen’s village atmosphere and way of life, which still remains – amazingly, perhaps – a reality alongside tourism. Starting from the east, Riomaggiore is a cascade of old, tall multicolored houses, often with frescoed façades in the typical Ligurian style; they all converge to a sheltered harbor where sailors still mend their nets and paint their boats to this very day, among beach-goers and tourists busy with their aperitifs. Heading west, Manarola is smaller, but also clustered around a small cove occupied by fishermen’s boats; its position and topography is somewhat more secluded, which perhaps gives it a more intimate feel. A higher stretch of the coastal path then leads from Manarola to Corniglia – the wine producing hub of the region, together with Volastra: a village which is perched higher up on the hillside but that – strictly speaking – does not belong to the Cinque Terre proper. Being right at the center of the region and on a high location, Corniglia offers sweeping views on either side of the Cinque Terre, and provides a welcome resting place if you are following the coastal path from either direction. But in our description we keep heading west, and another stretch up and down the hills – perhaps the most strenuous section of the walk – will take us to Vernazza, possibly the most historical of the five villages, and certainly my favorite. Here there are remnants of old Medieval houses, incorporated in the ‘palazzata’ (literally, “curtain of houses”) by the seafront, while the ruins of the castle command the best views in the whole of the Cinque Terre; the atmospheric ancient church is also perched directly on the rocks, right by the harbour. The old houses, the castle above the village and the church – surrounded by steep hills covered in vineyards – all combine together to form a picture-perfect image, which perhaps best of all sums up the quintessence of this landscape, magically suspended between mountains and sea. The last stretch – with stunning views – will take us from Vernazza to Monterosso, the biggest centre of the five: a more modern town with a charming historical part; a knot of alleyways clustered around the church, with its typical Ligurian façade striped white and black. Here there are also beautiful, vast sandy beaches, which make Monterosso the most ‘touristy’ of the Cinque Terre (below, the sea at Monterosso). 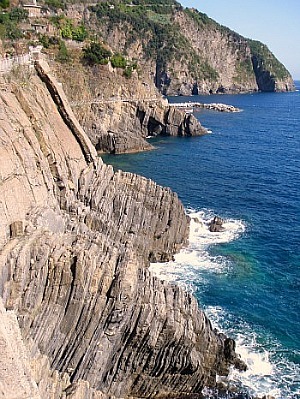 As for the more natural aspects, while walking along this coastline, be on the lookout for the constant variations in the rocks, that take the most contorted shapes and colours (for this, refer also to the geology of the Cinque Terre page). Most famous of all is the Portoro marble, found at Portovenere and on the island of Palmaria (thus, strictly speaking, out of the Cinque Terre proper), renowned for its gold veining and grey lustre. The most popular route after the coastal walk follows the high mountain ridge that runs parallel to the coastline. Taking in several peaks – and the highest elevation within the Cinque Terre, Monte Malpertuso (812 m) – the path runs the length of the summit between Portovenere and Levanto: a long haul which takes at least 12 hours to complete. Perfumed belts of maquis and garrigue (‘macchia’ in Italian), stands of Aleppo pine, and a huge variety of wild flowers grow along the Cinque Terre coast, and also on the Palmaria island and its outliers – Tino and Tinetto. Part owned by the navy, and only sparsely inhabited and cultivated as a result, these islands have a particularly rich and specialized flora and fauna, which has been helped to survive by the exceptionally mild climate, and thanks to the little encroachment due to relative lack of human activities. Orchids such as the Common Spotted Orchid (Dactylorhiza fuchsii), Burnt-tip Orchid (Orchis ustulata) and Toothed Orchid (O. tridentata) can be found here; the area is also renowned for its butterflies, and its reptile and amphibian populations. To get to the Isola Palmaria, boats sail from La Spezia or any of the Cinque Terre villages, but there is also an expensive crossing from Portovenere – even though this would be in fact the closest point to the island, as the stretch of water separating Palmaria from the mainland is here of only 400 meters. The coastal margins from Punta Mesco to Montenero have also been designated a protected marine reserve, rich in submarine sea-life and distinguished by such rarities as black coral. The whole region is wonderful walking country in its own right – something quite unique along the whole stretch of Ligurian coast. It is rugged yet gentle, with olive groves, citrus fruit trees, and the ever-present low vineyards. It is a particularly beautiful area to walk in spring, before it gets too hot, and then again in autumn, with the smells and the activities of harvest – but it can be absolutely rewarding even in the middle of winter, when the captivating scent of Qumquat (or Japanese Medlar; Rhyzobotra japonica) pervades the crystalline air and accompanies the solitary walker. In terms of walking, La Spezia’s CAI branch has seen to it that all of the Cinque Terre area is criss-crossed by marked trails: the two main ones – as anticipated earlier – are the “Sentiero Azzurro” coastal path (marked blue) and the ridgeway (described below), which involves a hefty climb and is marked in red. Minor tracks descend to the sea at several points along the way from both trails. The trail that from Portovenere goes along the high ridge which divides the coastal side from the internal side all the way to Levanto – over Punta del Mesco – is considered the path of the Cinque Terre almost by definition. 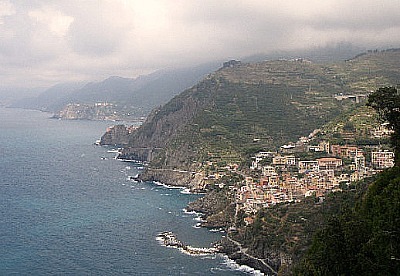 It is a smooth but long trail (about 40 km, half of which is contained within the boundary of the Cinque Terre National Park), recommended to sufficiently trained and equipped hikers; otherwise, it is possible to cover only a stretch of this medium-distance trail, choosing perhaps the most panoramic sections, and head down via one of the several paths that cut diagonally to the various villages of the Cinque Terre. Considering the particular orographic and morphological features of this territory, the trails of the Cinque Terre National Park can be considered in all respects similar to mountain trails, most of which are without any protection, with sometimes considerable differences in height and several exposed tracts. The trail bottom also varies according to weather conditions, and it can sometimes be uneven or muddy, so adequate clothing and appropriate footwear is required; in a word, these paths should not be undertaken lightly. One of the most interesting of such paths is the so-called “Trail of the Sanctuaries” ('Sentiero dei Santuari'), which not only crosses an enchanting territory, but also covers a long stretch of history. Once the peasant world of the Cinque Terre was as important as the maritime world, so it is not by chance if the 'Route of the Sanctuaries' (which are five; one for each village, listed below) winds up the mountain tops, as a witness to its ancient origins. As a matter of fact, according to some researchers, part of this route may correspond to an ancient track dating to the Bronze Age (1,800-900 BC), as demonstrated by the presence of menhirs in Volastra and Tramonti – probably linked to the presence of a Ligurian civilization settlement, to which also the two box-shaped tombs found inSoviore and on Monte Santa Croce could be ascribed. The oldest sanctuaries are situated above Monterosso ('Madonna di Soviore'),Vernazza ('Nostra Signora di Reggio') and Volastra ('Madonna della Salute'), while the religious buildings above Corniglia ('Nostra Signora delle Grazie e di San Bernardino') and Riomaggiore ('Nostra Signora di Montenero') are more recent. The route, developed along the mountain side and connecting all these different places of worship, is an open invitation to acknowledge oneself with this amazing territory through history, by crossing charming locations which are also very important in terms of the origins of the Cinque Terre (these 'lands' were first worked by monks). But leaving history aside, even the most distracted walker will not fail to be stunned by the majestic views that open up along the way, sweeping from the coastal inlets to the faraway sights – on clear days – of the Tuscan Archipelago and even the distant island of Corsica. In Case Pianca, above Corniglia – in the medium-high altimetric band of the Cinque Terre National Park (that can be reached also by using the Park's public means of transport) – horses and carriages can be rented for pleasant rides along trails and side roads, across Holm oak and pinewood thickets, while enjoying the views over the coast. Along the tracks, there is always an opportunity to stop and taste local dishes or sample the D.O.C. wines (such as the famous 'Sciacchetrà'), produced with the grapes cultivated in the ever-present vineyards overhanging the sea, and – should one wish to – is it also possible to spend the night in the guest house of an ancient Sanctuary or in one of the other off-road structures, such as the 'Agriturismi' (accommodation in a working farm). Update as of June, 2014. Please note the following important information. The Coastal Trail (formerly Sentiero Azzurro) is closed at the moment in the stretch between Riomaggiore and Vernazza for reasons of safety; only the last section (Vernazza to Monterosso) is open to the public for walking. In alternative one can take the upper sections that connect the various villages via the higher routes, which are as rewarding in terms of sights, although often more demanding as hikes (as an example, Corniglia can be reached from Manarola via Volastra). Notice also that the local branch of CAI is in the process of renumbering all the trails, and even the former Sentiero Azzurro is now being marked with the usual CAI red-white-red stripes, and given a new number).